Art, one of the best preserved sections of the Motor Parkway is near your parent's home in Hollis Hills, Queens. When the parkway closed on April 17, 1938, Robert Moses created a bike path over the first two and half miles in Queens. The bike path is still very active today and includes three well-preserved, original Motor Parkway bridges over Hollis Hills Terrace (see above), 73rd Avenue and Springfield Boulevard. 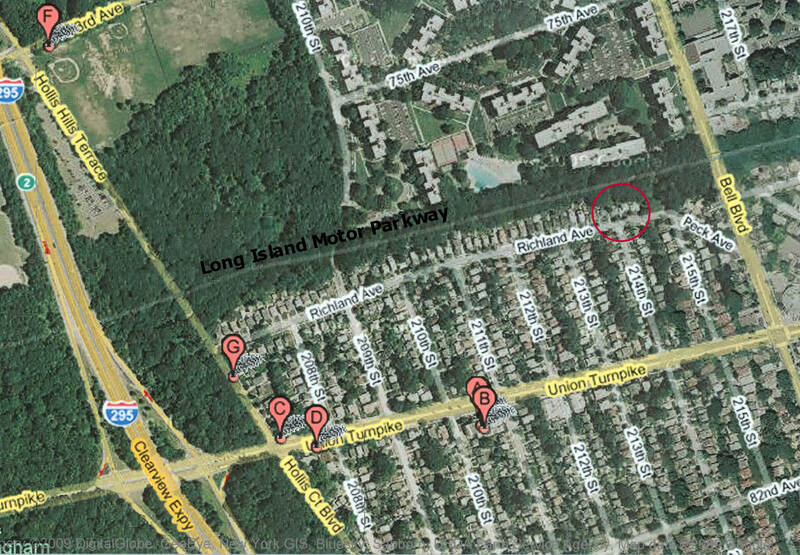 A recent Google Map aerial of Hollis Hills shows that Richland Avenue ran parallel to the Motor Parkway. The bike path can be clearly seen. Your parent's home is within the red circle. 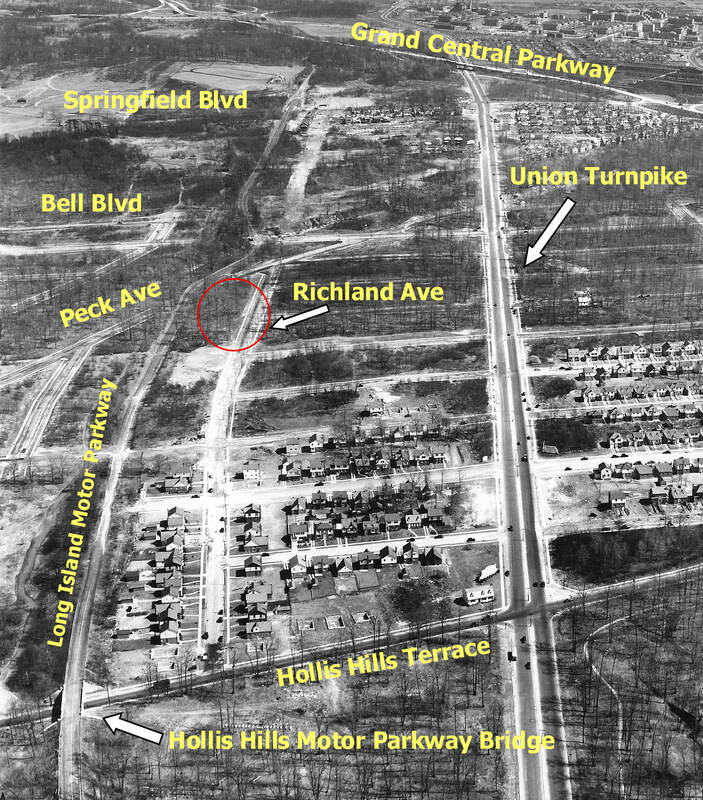 This dramatic March 1941 aerial shows the Hollis Hills homes around the Motor Parkway being built. Your parent's home is again within the red circle. Note the unusual curve of the Motor Parkway near Peck Avenue. I believe this parkway route was built to take advantage of an existing abandoned railroad bridge at that location.Also, compare the width of the Motor Parkway in comparison with Union Turnpike. 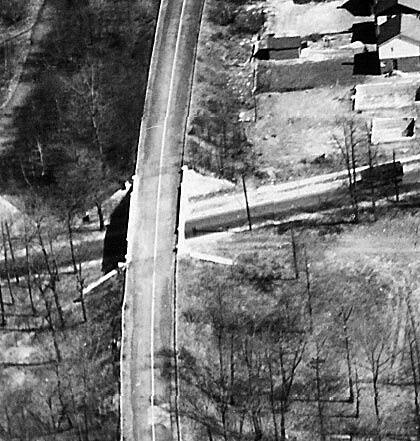 Finally, a close-up of the 1941 aerial of Hollis Hills Motor Parkway Bridge shows the white dividing line even though the parkway had been closed for three years. Cleaning up the former Long Island Automotive Museum site would be a neat idea but one would have to get permission from the Clark family, and probably have any or all who wanted to do this sign a waver of liability. The building itself would probably not be the safest to go into, when it was last open it leaked badly with every rain storm as the roof area had rusted out after 45 years. People are curious, and a lot of control as to who could wander where would be needed, a major task. This map explains so much to me! I live right near Union and The Grand Central and have always wondered about so many features as I ride the path on my bicycle. Thanks Howard for continuing your research!